Emerging Malaysian filmmaker Zahir Omar says sincerety plays a crucial part in his work, including his feature debut Fly by Night, which was featured at the Jogja-Netpac Asian Film Festival’s (JAFF) Asian Perspective program on Saturday. Starring Malaysian veterans, such as Sunny Pang and Bront Palarae, the movie follows a group of taxi drivers and extortionists who are forced to pull off a heist to pay off debts. The crime thriller won positive reviews at its world premier at the Busan Film Festival in South Korea in October. Speaking to scores of journalists after the screening at JAFF, Zahir revealed that he chose to explore Kuala Lumpur’s underground world as it allowed him to show the dark side of life. The setting also enabled him to develop strong characters. “I think that’s the main goal of films, to remind us that we are all human. That is a film for me,” Zahir said. Zahir, who once worked as assistant director to the late renowned Malaysian director Yasmin Ahmad, said the most important thing in filmmaking, whether indie or mainstream, was sincerety. “You also have to be true to yourself, that you want to communicate with the viewers,” he said. A film, he said, had the power to eliminate loneliness. By watching and understanding a movie, one may realize that his or her emotions or experience are reflected in the movie. A film, therefore, is like a mirror. A film does not necessarily need to have a happy ending. According to Zahir, what is more important is that the movie features characters that feel real and relatable. Born in 1982, Zahir studied Film and TV at Queensland University and built his career mainly as a TV commercial director. “I’ve been in commercials for the last 10 years,” he said. He produced commercials both in Malaysia and Indonesia and worked with major brands, such as Google and McDonald’s. Feeling that he had gained enough knowlege to produce a long form film, he finally worked on Fly by Night. The project was stalled following the death of the film’s scriptwriter. It took five years for Zahir to finish the script. With the support of his friends and collegues, Zahir started the one-month-long filming in January. The project also received funding from Busan Film Festival for its post production. 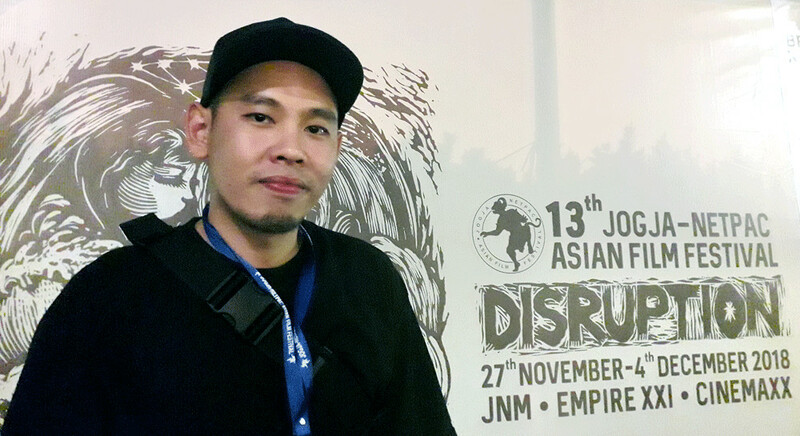 Zahir was glad that his debut work was featured at JAFF, which he referred to as a good platform for Asian cinema. “I am just happy to be at festivals. First in Busan and now here at JAFF,” he said. Zahir also said the Indonesian film community was very strong. “I see familiar faces I saw in Busan, meaning that the film community here is also well traveled,” he said. After its screening in Jogjakarta, Fly by Night is slated to appear at film festivals in Macau, China and Santa Barbara, California. Asked about his future plan, the father of two said he planned to produce more good movies, travel more and be involved in more film festivals. Zahir expressed his desire to explore other genres, but he underlined that his upcoming movies would convey the same message: There is no black and white and that all human being are the same. He is currently working on his second feature, which will involve more Indonesians in its cast. Zahir hopes to finish the movie in two years. To aspiring filmmakers who dream of producing their first feature film, Zahir urged them to aim high and to immediately work on their project.